The couple has always stayed dedicated to GVSU – they have touched the lives of many by actively being involved in students’ and staff members’ lives. To remember and honor their legacy, the Office of Student Life, Student Senate and Campus Activities Board have put together a special event called Haasta La Vista – one last celebration of all their contributions to the community. Haasta La Vista will be held Friday, April 19 from 3 to 4 p.m. at Fieldhouse Arena. Attendees will celebrate with Haas' by enjoying a lively evening of music, entertainment, delicious food and free t-shirt giveaways. Students will also be able to say goodbye and get one last selfie with GVSU’s ultimate power couple. All Lakers are welcome to come to Haasta La Vista free of charge. The night will be kicked off by the GVSU Laker Marching Band, which will be performing GVSU anthems honoring President and Marcia Haas. “We are really hoping for a good turn out because T. Haas and Marcia really deserve a great student turn out for all the years they have been here to support us,” Mattler said. During the ceremony there will be speeches, videos, presentations, awards and a speech by President Haas himself. The other speeches will highlight the contributions and appreciation of President and Marcia Haas. 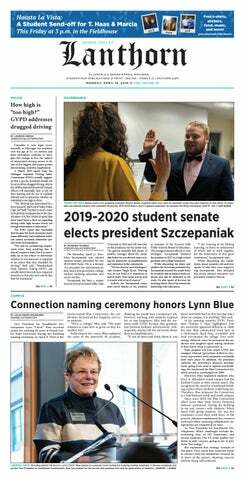 “President Haas has had a consistent passion, energy and love for students since his first day,” said Student Senate President Rachel Jenkin. In an interview with the Lanthorn, Haas said that the students have always been his North Star. He is the only university president in Michigan who allows the student government president to testify in Lansing for increased state funding. “If that doesn’t scream student centered, I don’t know what does,” Mattler said. Due to President Haas being a huge pizza fan, there will be loads of fresh, warm pizza along with drinks and cookies. After Haasta La Vista, President and Marcia Haas will be sticking around for anyone who would like to talk to them and say their final goodbye’s. Lakerpalooza will conveniently follow up Haasta La Vista.